Taking an insightful look at the knotty question of determinism, this book is perfect for anyone filled with questions of freedom and choice. Do you feel riddled with questions about faith? 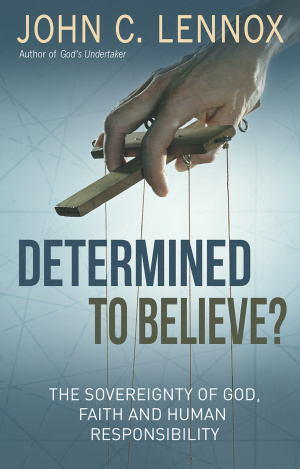 Determined to Believe is written for those who are interested in or even troubled by questions about God's sovereignty and human freedom and responsibility. John Lennox writes in the spirit of helping people to get to grips with the biblical treatment of this issue for themselves. In this comprehensive review of the topic of theological determinism, Lennox seeks firstly to define the problem, looking at the concepts of freedom, the different kinds of determinism, and the moral problems these pose. He then equips the reader with biblical teaching on the topic and explores the spectrum of theological opinion on it. Following this Lennox delves deeper into the Gospels and then investigates what we can learn regarding determinism and responsibility from Paul's discussion in Romans on God's dealings with Israel. Finally Lennox tackles the issue of Christian assurance. This nuanced and detailed study challenges some of the widely held assumptions in the area of theological determinism and brings a fresh perspective to the debate. Determined to Believe by John C. Lennox was published by Lion Hudson Plc in September 2017 and is our 17150th best seller. The ISBN for Determined to Believe is 9780857218728. Be the first to review Determined to Believe! Got a question? No problem! Just click here to ask us about Determined to Believe.